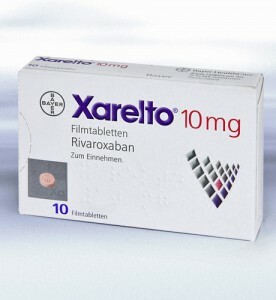 Manufactured under the brand name Xarelto, rivaroxaban is a direct thrombin inhibitor, one of a new class of anticoagulants prescribed to patients with non-valvular atrial fibrillation (AF). The drug functions by decreasing the blood’s clotting ability, thus reducing risk of stroke among individuals who suffer from irregular heartbeats. In addition to stroke prevention, the blood thinner is also prescribed to help diminish the risk of deep vein thrombosis (DVT) and pulmonary embolism, which are characterized by dangerous clots in the deep veins of the leg and lung, respectively. To date, more than seven million people have been prescribed Xarelto, which was heavily promoted as more convenient alternative to Coumadin (warfarin) – a highly effective blood thinner that requires regular blood tests, dose monitoring and a strict dietary regimen. However, since its introduction to the U.S. market in 2011, reports of life-threatening Xarelto side effects have come to light, with patients suffering serious injuries caused by uncontrolled internal bleeding. While Xarelto manufacturers state that bleeding risks may be increased if patients are also taking aspirin, Plavix, warfarin, or non-steroidal anti-inflammatory drugs, many consumers are asking whether adequate warnings were provided, and if Xarelto poses unreasonable risk of excessive bleeding, since no reversal agent has been approved. Xarelto tablets are typically supplied in 10 mg, 15 mg or 20 mg strength to be ingested orally once daily, with or without food. Patients are advised to stop taking rivaroxaban and seek immediate medical attention in the event of any of the following side effects. According to the product medication guide, Xarelto “can cause bleeding which can be serious, and rarely may lead to death.” Bayer Healthcare and Janssen Ortho, LLC state in the drug’s Warnings and Precautions section that premature discontinuation of any anticoagulant, including Xarelto, in the absence of alternative anticoagulation treatment, increases the risk of thrombotic events. Similar to Pradaxa, another blockbuster anticoagulant taken by millions of Americans, Xarelto has no specific antidote to stop its anticoagulant effects. As a consequence, rivaroxaban patients are at much greater risk for uncontrollable bleeds once they begin. Reuters recently reported that pharmaceutical giant Bayer and J&J’s subsidiary Janssen are now facing their first lawsuits arising from Xarelto internal bleeding problems. Once recent claim brought in Pennsylvania federal court alleges that the victim suffered near fatal gastrointestinal bleeding after taking Xarelto. At the heart of this burgeoning litigation are allegations that Bayer and Janssen failed to properly warn of Xarelto side effects, and relied on deceptive advertising that downplayed the medication’s true bleeding risks. The defendants are accused of designing, marketing and distributing a drug that is clearly connected to irreversible bleeds, permanent injury, and in some cases, premature death. Xarelto lawsuits are being filed on an individual basis, but if litigation continues to grow, these complaints may be consolidated for more efficient pretrial proceedings. Less than a dozen claims have been filed thus far, and Bayer continues to stand by the efficacy and safety of its product, which it says is backed by extensive clinical studies. Were sufficient warnings provided about Xarelto risks? All prescription medications carry risk of unpleasant side effects, but what has yet to be determined by the courts is whether Xarelto manufacturers failed to provide adequate warnings and information about increased risks of bleeding events, and if they will be held legally accountable for such actions. As noted in a recent Xarelto wrongful death claim, in the last two years, 1,080 Xarelto-related “Serious Adverse Event” (SAE) reports have been filed with the FDA, suggesting that product liability litigation is poised to explode on a national level. All drug manufacturers are required by law to provide adequate disclosures in their product label of potential risks and side effects. Should companies be found liable for strict product liability, failure to warn or fraudulent misrepresentation, they may be forced to pay compensatory damages, sometimes in the millions of dollars depending on the extent of injuries sustained. False claims or representations are often at the crux of dangerous drug litigation, such as that arising from Xarelto bleeding injuries. Currently, Xarelto lawyers are reviewing cases of injured victims to determine if they are eligible to file lawsuits.